Charles Mann was actually an in-law. My Great Granny was Sarah Ann Crosby and she had a sister called Eliza who was born in 1854. These two were born in Butley in Suffolk. Great Granny, like nearly all of the Crosby family moved away and she made her home in Sussex, at Isfield, but Eliza married Charles Mann in Butley on 24th December 1885. Charles came from Yoxford and was born in 1856. Yoxford is a few miles north of Butley and we can find young Charles there in 1861 with his parents – father was a farm worker – and younger siblings. By 1871, teenaged Charles was a shoemaker’s apprentice. He was learning the trade that supported him through his life. He was still living with his parents in Yoxford. 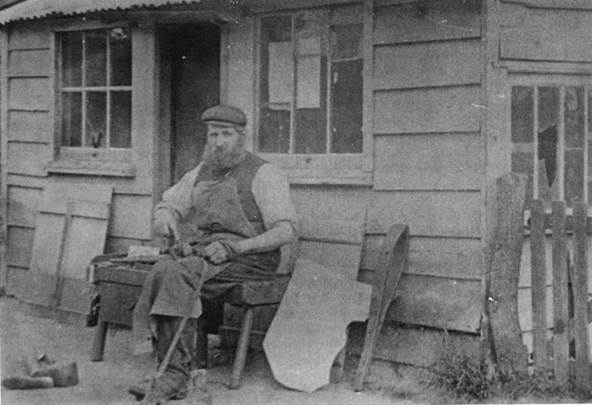 Ten years on, in 1881, Charles was still with his parents, but by now, as a fully-fledged shoemaker, he’d have been adding to the family economy. Quite why or when Charles moved to the Butley area, we don’t know – but we have the wedding date and from then on we find Charles, Eliza and a growing family in Butley. Actually, their first two children were born in Chillesford. Charles remained a shoemaker or bootmaker according to 1891, 1901 and 1911 census. I have a photo of Charles working outside as he approached old age. I think Charles died in 1931 and Eliza in 1932. The little extra in the story came in 1887 when my great grandparents, living in Isfield Sussex, had a baby boy they called Charles Mann Stevens. He surely must have been named in honour of his uncle and it suggests that despite distance and poverty, the two families certainly maintained contact. Sadly, Charles Mann Stevens died in 1888, the year his cousin, Charles Mann was born in Butley to Charles and Eliza. What a shame these cousins never had a chance to meet. Some years ago I purchased a CD which had images of old parish magazines from Burwash in East Sussex. I knew I had family from that location and on scanning through I found the name Clarke- a good family name. I wrote something at the time (2008). Here’s what I wrote. Adelaide Frances Clarke was baptised on December 18th 1881 at Burwash, according to the January 1882 edition of the parish magazine, which was called Home Words for Heart and Hearth. This is a copy of that part of the magazine. My Great Granny Frost had been born Ruth Clarke and she certainly had connections with the Burwash area. In fact Great Granny had a cousin called Adelaide Clarke, born in about 1839 at Burwash. This Adelaide had married James Leaves and this family are known to be buried at the Heathfield Independent Chapel on Cade Street. Maybe Adelaide Frances was linked to this other Adelaide, and thus to me. Adelaide ought to be easy to find, for the name is slightly unusual and we know that her mum and dad were Jane and James. But Adelaide may well have been born after the 1881 census and so she’d have to have survived close on ten years to be on the 1891 census. I try to make sure I find a person on a census search. Clarke is often spelled without the final e – as Clark. So I search for Clark* because that gets both versions of the name. Adelaide was clearly born before December 1881, but an age on the census was ‘age last birthday’. She might well be only 9 and parents can often get ages wrong, so I’d search for a birth year of 1881 plus or minus a couple. It’s a fair bet she was born in Burwash, but not certain. I’d use my knowledge of the area to help to be sure I was finding the right Adelaide. But in this case it is easy. The 1891 census has 14 Adelaide Clark* born between 1879 and 1883. One of them has parents James and Jane and she was born at Burwash. The birth year given is 1882 and we already know she was born before then. We can also see that James and Jane have been up to rabbit standard when it comes to producing children. James and Jane have ten children, all under the age of 21. No wonder the family, at Bardown Cottage in Ticehurst, stretches onto two pages of the census book. But those older siblings might prove useful in tracing back, and the three oldest lads, like their father, agricultural labourers, are probably helping to make the family feel prosperous. James was 40 and came from Burwash which is a good omen for a family link to me. Jane was a mere 38 and from Ashburnham. The Freebmd web site records a marriage between John Mitchell and Adelaide Frances Clarke in the first quarter of 1899, Hailsham district. It looks as though Adelaide was, like her mother, a fecund young lady for by the 1901 census there were two young Mitchells in the family. Just to make life a bit harder for the researcher, the transcriber of the 1901 census has spelled a forename as Adalaide. In finding our Adelaide, I had to try things out – first Ade* and then Ada* , born in Burwash in 1881 plus or minus a couple. That gave me a possible Mitchell surname which Freebmd confirmed. Looking back to 1881, we find that Adelaide was not born. James and family lived at Witherenden Cottages in Burwash and James was a dairy man. The oldest child, Edward, was 10. James was given as 33 so there’s an age problem with him. But Edward allows us to find the family easily on the 1871 census. James was 24 and Jane 17. They lived at Ale Thatch in Ashburnham and James was a farm labourer. Surely an 1861 census, or an 1851 one can find the link. With James’s ability to be a bit variable in age, I could have problems. But I’m sure he was born in Burwash so I should get him. 1861 gives James as a servant at Brightling which is not useful to me, but 1851 has four year old James as a son of Thomas and Sophia Clarke and a brother of that older Adelaide. So James, too, was a cousin of Great Granny. Adelaide Frances was her cousin once removed – my Grandad’s second cousin. This family lived at Glazers Forge, a place I know, well out of the village. In 1841, Thomas and Sophia had been at Little Poundsford, also out in the sticks, not so far from Glazers. I’d have liked to have identified, for certain, James’s wife, Jane. FreeBMD gives a possible marriage but of course, a list of two men and two women on a page does not tell you who married who. However, James Clark and Jane Cramp are listed on the same page, in the appropriate Battle area, in the first quarter of 1870.This fits well with the birth of young Edward towards the end of 1870. But the 1861 census gives no Jane Cramp from Ashburnham. It does give a Jane Winchester of the right age. I’m left with a question mark. I still think it was Jane Cramp, for there was Cramp family in Ashburnham (parents Charles and Clarissa) and they were producing children at a time when Jane was born and they have a gap into which Jane would fit – perhaps the Jane listed on FreeBMD as born in 1854 in the Battle district. I think she missed the 1861 census for some reason.